Inderjit Singh Mukker was attacked by a bigoted white youth during a traffic stop who called him ‘bin Laden’ before he viciously assaulted him. In light of all this, it comes as little surprise that in a violent country such as this one, Sikh Americans have been consistently brutalized and even killed because of their faith and appearance. Just two weeks ago, a 53 year-old Sikh man named Inderjit Singh Mukker, whose been a U.S. citizen for nearly three decades, was driving on his way to the grocery store when he noticed a belligerent white youth in a truck trying to cut him off the road. As he swerved and drove recklessly on the road, he yelled at Mukker, “Terrorist, go back to your country, bin Laden!” When Mukker’s car came to a stop, the teen parked his vehicle and approached the Sikh man. Once he got to the car, he walked over to the driver’s side, reached through the window and proceeded to violently assault Mukker, leaving him beaten, bludgeoned and in such bad condition that he had to be hospitalized after he lost consciousness. Inderjit Singh Mukker’s horrifying experience with a white youth targeting and discriminating against him for falling into the category of “otherness” – that is, not white, not Christian – echoes the experiences of Amardeep Singh, the director of the Sikh Coalition. As a youth, Singh recalls being bullied in a way that “evolved through the years in line with the political agenda of the United States.” For example, “During the Iran hostage crisis, I was told to go back to Iran, during the first Gulf War I was told to go back to Iraq, and after 9/11 I was called ‘bin Laden. '” Bullying of Sikh children in school is an all too common occurrence. It is a fact of life for every Sikh child that they are bullied at more than twice the national average, a number that grows to as high as 70% if they wear traditional Sikh religious attire, such as a turban. These children can expect to be called “terrorist”, “bin Laden”, and told to “go back where you came from” at some point in their young lives. The past decade and a half has borne witness to some of the most horrific acts of terror carried out against Sikh communities and places of worship. The first death from a hate crime in the immediate aftermath of 9/11 was of a turban-wearing Sikh man in Mesa, Arizona. 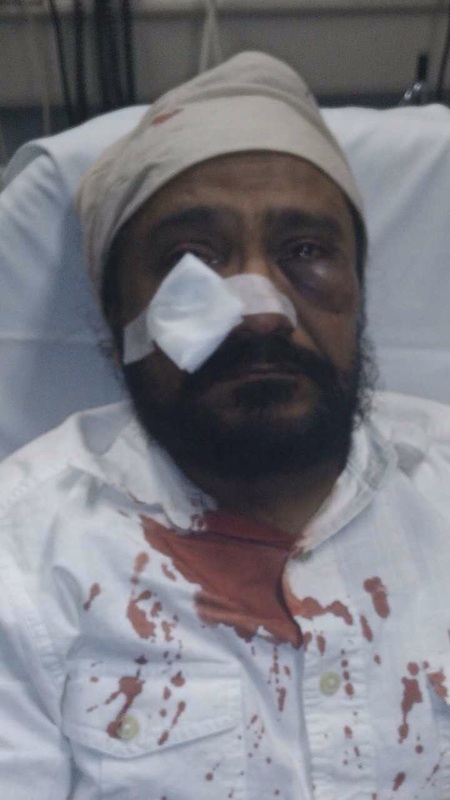 In 2013 a respected Sikh professor at Columbia University was savagely beaten by as least 30 teenagers who ganged up on him in New York City. The intensification of anti-turban wearing hysteria culminated in the August 5, 2012 massacre of six worshipers at Sikh Temple in Oak Creek, Wisconsin by a white supremacist army veteran who walked in and opened fire on congregants. This just leaves me aghast. This is truly the result of ignorance and not paying attention. They are such a peaceful and respectful group of followers, this leaves me horrified. But I didn’t say surprised. Because we as Americans seldom take the time to know our own neighbors. Seldom take to educate ourselves beyond the norm. Smh. I feel like apologizing to him and his family. Deplorable and enraging. The people who need to be apologizing are those who spread this toxic atmosphere of fear and hate, for example all the current GOP presidential candidates. Grateful as ever, not every. Lol. Anyway, squeeze in time for your passions. Life is surprisingly short. And thank-you, glad to see you posting too. Best regards and stay in touch! I am so sorry to hear that! The slogan should be changed to “liberty and justice: something you’re either born with or not”. Immediately after 9/11, I saw Sikhs at supermarkets accompanied by elderly whilefolks. ( that was to protect them from the mob ) . The haters thought Sikh turbans were Muslim attire. Exactly. People are so ignorant. Of course it goes without saying that even if they had been Muslims, which they weren’t, they still had nothing at all to do with 9/11. Fear and bigotry …. about anything “different”. This is just one of the many things that is wrong with America!